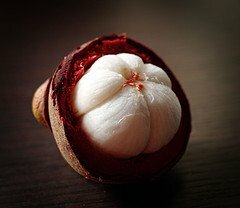 Mangosteen, or "Queen of Fruits" promotes good health. The white, moist, soft and juicy flesh of the fruit is sweet, aromatic, and tastes great. Southeast Asia have revered the mangosteeen, both for it's flavor and the suggestion that it promotes good health. In early years this fruit recorded to have supported and maintained good health. Xanthones are a newly discovered, class of biologically active polyphenolic compounds structurally similar to bioflavonoids. Xanthones appear to possess numerous potential beneficial properties such as, anti-allergic, anti-inflammatory, anti-tuberculotic, anti-tumor, anti-platelet, Beta-adrenergic blocking and … anti-convulsant properties. The fruit's seed contains sterols are plant lipids or fats, the best known supplement in this class is omega 3 fatty acid. Fiber is important in the maintenance of gastrointestinal health. Xango Mangosteen Juice Craze was sweeping the North America and international markets!